I was talking to some ladies in one of my classes last week about their plans for Mother’s Day. It turned out to be a really funny conversation and rather interesting to hear how everyone spends the “holiday.” I assumed that everyone spends the day, or at least most of the day, with their children and families. Not so! More than one mother in the group takes the day off and goes for a hike with friends or spends the morning at a spa, basically taking mommy time off! I thought that was really cute, although I don’t think I would have the courage to propose that in my house. One woman did confess that her mother-in-law was completely insulted that she didn’t want to spend the day with her! Of course, going out to eat seems to be a very popular way to give mothers the day off from cooking and to show them how much they are appreciated. Even though I love to cook, it’s always nice to have a break and eat someone else’s food. But I can’t say that going to a restaurant on one of the busiest restaurant days of the year with a large group, including multiple toddlers, is my idea of relaxing. I also don’t love buffets for several reasons — I always eat too much; I don’t like getting up multiple times during my meal; everyone seems to get up at different times and we lose any chance at meaningful togetherness and conversation; the thought of lots of germy children’s fingers contaminating the chocolate fountain makes me skittish. Ewwww. A couple of years ago, I had enough of that and suggested to my husband and his family that we do what my friend Melissa’s family does — all the guys cook lunch at home for the ladies. How brilliant is that? Seriously, best idea ever. I don’t even care what they make, as long as I don’t have to do any dishes. Although last year they made some delicious bulgur burgers from Maria Speck’s “Ancient Grains” cookbook, as well as some beautiful salads and a peach and blueberry claufouti. So amazing! Mother’s Day brunch seems to be very popular and I thought it would be a good idea to share a really delicious and easy frittata recipe. When planning a brunch, I always try to incorporate some protein and vegetables to balance out all the ubiquitous carbs and sweets. This one is so perfect because it uses seasonal asparagus and leeks — really spring-y! When I make frittatas for us at home, I will cook it in the same skillet I use to saute the vegetables and serve from the skillet. But if you’d like to serve this as part of a buffet, I would pour everything into a pie plate or tart pan. Looks prettier that way. I don’t have a non-stick skillet, but if you choose to use one, you can also slide it out onto a serving plate from your skillet. You can also make this into little “muffins.” Take a look at the images from my Kale and Brown Rice Bake and you’ll see what I mean — super cute! What’s so nice about frittatas is that you can serve them hot or room temperature and any leftovers are fantastic as a sandwich. Like later that evening, so you can really have the whole day off! Preheat oven to 350 degrees. Heat oil or butter in a 10-inch ovenproof skillet over medium heat. 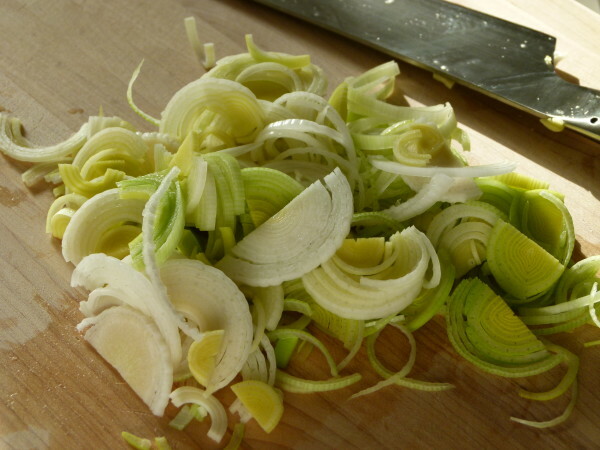 Add leeks and sauté until tender, about 4 minutes. 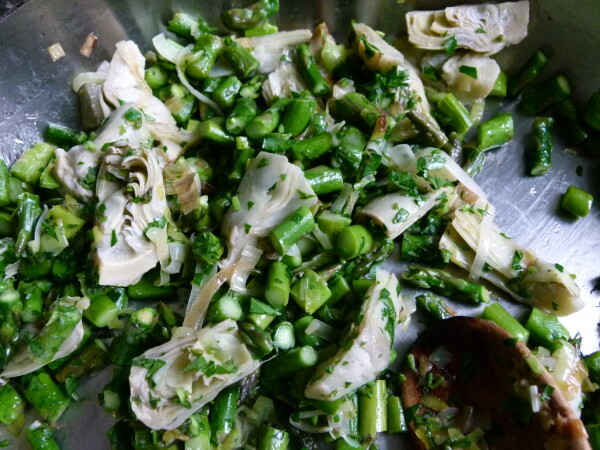 Add asparagus and artichokes, sprinkle with ¼ teaspoon salt and sauté until asparagus is tender, about 6 minutes. Stir in parsley and turn off the heat. In a large bowl, whisk together eggs, mustard, cheese, ½ teaspoon salt and black pepper to taste. Add vegetables to egg mixture and combine. At this point you can pour the mixture back into the skillet or you can use a similar-sized baking dish, such as a pie plate or tart dish. Just be sure to grease it first with oil or butter. Bake in preheated oven until set, about 45 minutes. If you’re in a hurry, you can cook it at 375 degrees for about 35 minutes. 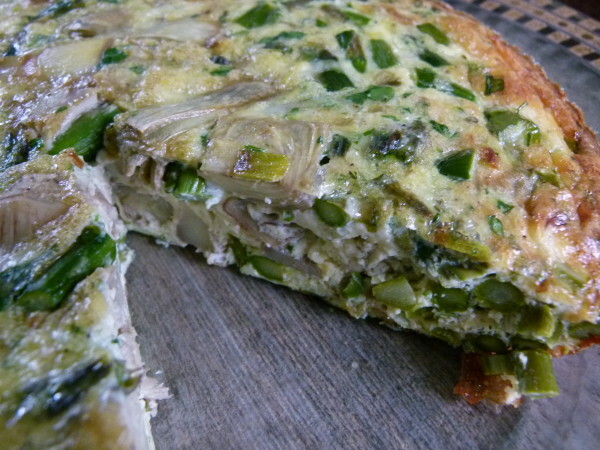 I have also added a little ricotta to this recipe which makes the frittata nice and light. If you have any in the fridge, whether a few tablespoons or up to a cup, feel free to whisk it into the egg mixture. I forgot to mention~~I bought your friend’s book on ancient grains~ WOW. thank you mentioning her,,what an author! there are so many new ideas–I will try and marry one of her recipes a week with your recipes. it would make a wonderful gift for anyone interested in fabulous food. It’s a great book, isn’t it? Although Maria Speck isn’t exactly my “friend!” I think she’s awesome, though! this looks so delicious,,and maybe a sneaky way to let the kids try some veggies 🙂 by a tart pan do you mean the shallow 1″ ones,,or is that too shallow and the frittata wont be thick enough. I used a gratin dish, but you can use a pie plate if you want. I think those are about 1-inch deep. Most of the time I just serve it out of the skillet! 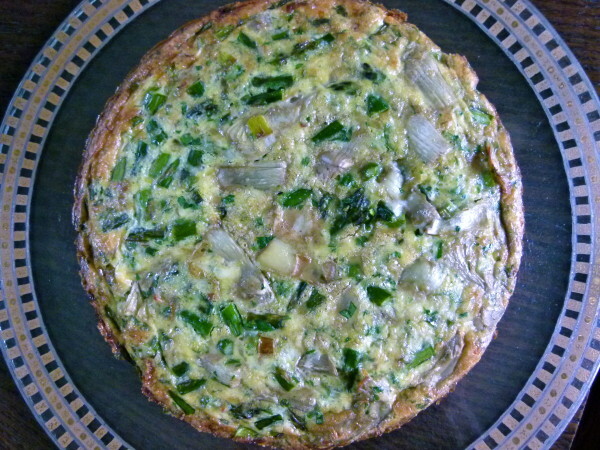 I am planning to make the frittata for Father’s Day this year. Would shredded mozzarella work instead of the other cheeses that you suggested? My husband only eats that type of cheese, but the other members of my family will enjoy any cheese, and I am trying to keep everyone happy…..
Definitely! I think mozzarella has less flavor, so perhaps you can toss in a small handful of grated Pecorino or Parmiggiano. But if you think your husband will notice than just add in the mozzarella and don’t worry about it. It will be delish! Can you use egg whites instead of whole eggs for this? You can if you want, but a frittata that is entirely egg whites is not quite as rich and flavorful and the texture is a little different. But, you would substitute 2 egg whites for every whole egg. If you can have a little yolk in there, perhaps do 4 whole eggs and 8 egg whites. Hope you enjoy it! On Mothers Day you gave me a gift that reminds me of my Mom’s (many tears passed) cooking. The taste of this fratata brought an instant smile to my face and a familiar “heart-taste bud” warmth to my soul. Thank you for this and all of your incredible recipes. Barbara, that is so lovely. Isn’t it amazing how food creates and brings back memories? Hoping you had a beautiful day! I understand. Why don’t you saute the veggies the day before and keep those in one container. Then beat your eggs in another container. The next morning, in the time it takes to preheat your oven you can grease your baking dish and combine the veg with the eggs and cheese. I think that’s your best bet! Happy Mother’s Day! Great recipe! 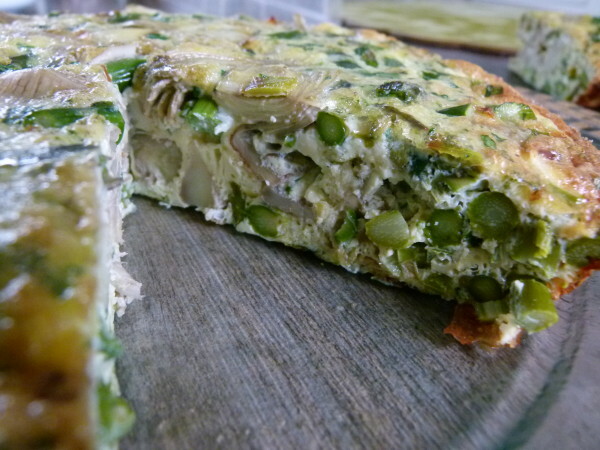 I love asparagus frittatas and often use peas instead of artichokes (a combination of the 3 vegetables is also possible). 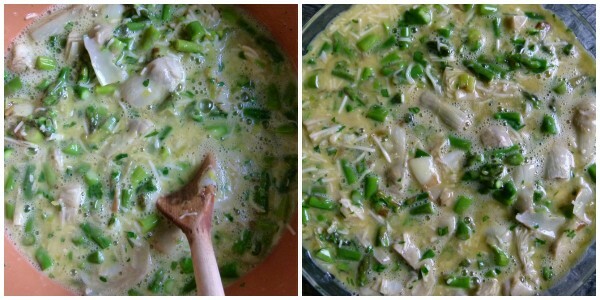 I use spring onions (or leeks), scallions, chives, garlic and dill quite frequently. 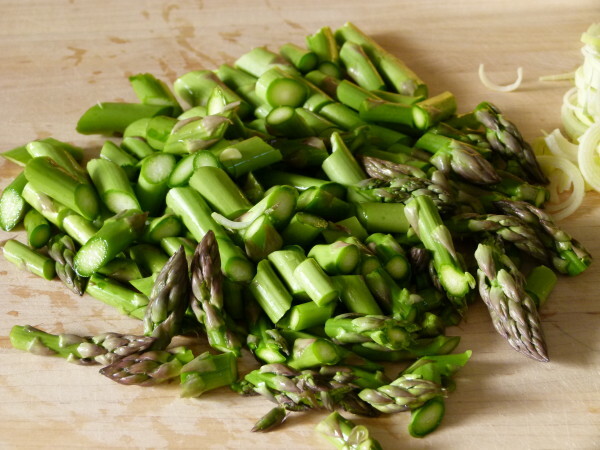 In fact, our town’s first farmers’ market of the season began today, and I bought lots of beautiful JERSEY asparagus. Give you 3 guesses what I’m going to do with some of them! Happy Mother’s Day! I’m so excited for you, Mia! I hope your farmer’s market does well. I know there are many excellent farms in Jersey. Funny that you mention peas because I just made a delicious pasta with asparagus, peas and mint last night — wish I had photographed it! Very good, but instead of dijon mustard, I would use some red hot pepper sauce from calabria for a little kick, you can also substitute or add some fresh mushrooms…..